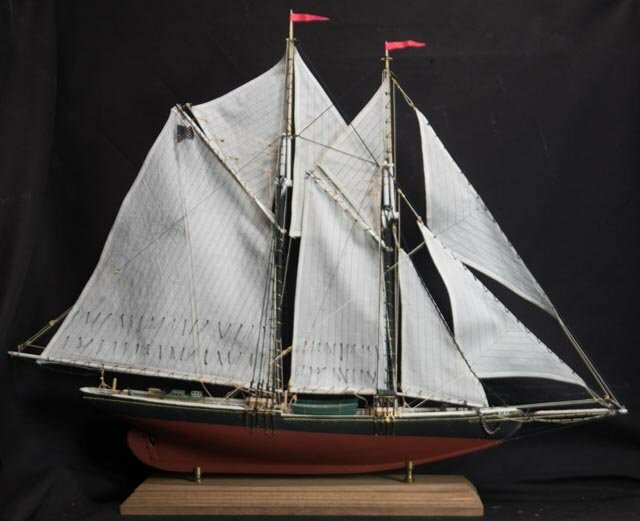 This is my Model Shipways MS2005 “Elsie” Gloucester Fishing Vessel circa 1910, solid carved hull, made in 1/8” = 1 ft scale. No, I’m not going to put it in a bottle since it is almost 2 ft long and 1.5 ft tall. The only reason I’m posting it here is that this is the impetus that got me back to modeling ships in bottles. I’ve had this kit since Christmas 1979. I worked on it a bit back in the 1980’s and put it away. It had been sitting partially completed with its parts in a box on top of my work bench in my basement for almost 25 years until I decided to overcome the “paralysis of analysis” and finish it this winter. I didn’t realize until I was almost finished with it that Model Shipways was still in business and that they would provide me replacement parts, free of charge. A variety of factors had prevented me from finishing this model. First off, I had very little instructional material to help me with the build. These days these kits come with very detailed and complete instructions but back in 1979 about all I had was a set of plans and a brief instruction sheet that may as well have just said “use wooden parts to construct model to plans”. Then, in my impetuous youth, I made some rookie mistakes that deemed the model less than “museum quality”. I had to come to the realization that I wasn’t going to send it to a museum, it would only be displayed for my pleasure and at 1/8” scale I probably could never get museum accuracy anyway. I also had to decide if I was going to put sails on it even though Model Shipways didn’t recommend sail work, especially for rookies. I worked on this model almost 8 hrs a day, 7 days a week for a full month. It was “unfinished business” and I wanted to complete it but also to get it as right as possible. I scrapped inferior work and reworked it if I had to. I still made some rookie mistakes and I’m not sure I belayed all the lines to all the correct places but I was damn proud of it when I was finished. I also realized how little I knew about sailing ships even though I had built five ship-in-the bottles before. I learned the value of having good plans, of measuring accurately and working patiently and a few other small tricks – all that applies to ship-in-the-bottles. Therefore, I have to recommend that if you want to become a better SIB builder, try one of these larger scale models at least once (with a pre-carved hull – planking a built up ship is a whole other world). I came away from this exercise with a new confidence that now I could do higher quality work than I had in my youth and I wanted to reprise some of my early SIB fails. Beautiful. I agree you learn a lot by working on the bigger models. The couple I've done have given me a great perspective on how ships work. Would be nice to see one in a bottle, hint hint! Nice job Lubber she looks, Grand! Thanks Jeff, I thought about making one in a bottle but I have one that I bought that looks just like her. I have a backlog of SIB projects that I'm working on first but might use the plans someday.